Use the calendar to check for upcoming events and orientation sessions. Event features dinner, live entertainment, raffles, silent auctions, 50/50 and much, much more! Additional Info: Please contact Tuni at 480-288-5174, or Barb at 480-550-1946. Car Clubs: $200.00 prize, plus a special plaque for the Car Club with the most entries. First 25 entries receive a food voucher. Additional Information: Contact Tuni at 480-288-5174, or Barb at 480-550-1946.For additional information please. Everyone who has a house broken dog with up to date shots is welcome to enter their doggie. If you don’t have a doggie, come and join in on the fun anyway! Prizes will be awarded. Event helps our organization keep obedience and service dog training affordable. Additional Info: Please call: Tuni 480-288-5174, or Barb 480-550-1946. 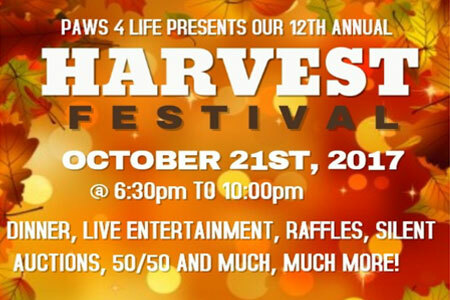 *Half of the ticket fee goes directly to support Paws 4 Life, and the other half is for the event. Live Entertainment with music by Robin. Also, Arts & Crafts by local artists! We can have a shuttle pick you up.